Cause and effect? whose the victim? American taxpayers? or Mexicans not standing up to nafta? The cause of immigration is over-population due the lack of birth control and the fact that the Govt of the Country doesn't care about it's poor. Case closed. Any other excuse is just that, an excuse. Are any of the reasons you said. I called it Karma, American business intentions was to make more money, instead they got a long list of headaches. AND THAT IS PROVEN, TO THIS DAY. How about the corrupt Mexican government and the ex-president's brother who runs the Conosupo stores that undercut the farmers' prices so much they had to pretty much give up raising crops? see thats the thing they could have keep exploiting its own domestic market sort of like our bankrupt country subsiding industries that cannot self support themselves. 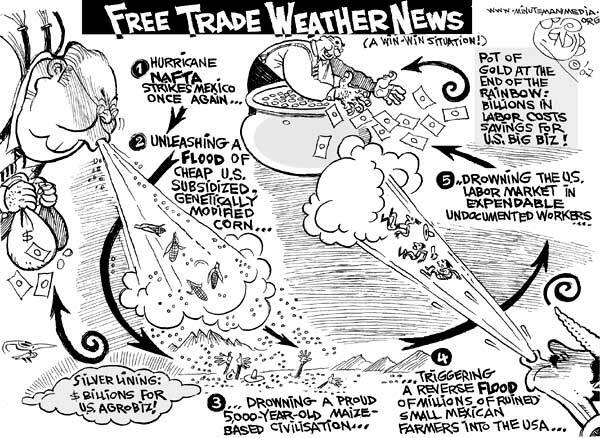 So just view it as a big tariff, now the farmers keep doing the same thing cause they did not no any diffrent til america came and defenitely destroy their way of income. Last edited by iturbide1981; 03-19-2009 at 09:51 PM..
the funny thing now is, that Mexico is our 2nd destination of agricultural products lol..and guess what? with their labor. so who did who to who? what needs to be corrected? enforce the laws? and strikethe farming industry first? agree, if you disagree then you must have diffrent principles than most of us that has bankrupt america with our consuming ways. centuries. Many things are imported because we do not produce/make it here. other country as well that I feel does not have tight agricultural guidelines. produce grown in mexico is something I avoid. Spark-plugs for the car, a paint brush, are things I don't have a problem with..
of other Americans who feel the same way. Americans pushed for it. better safe than sorry. Last edited by Arizona Bound; 03-20-2009 at 07:34 AM..